Each book in the Cotton Creek Romance series is a standalone, full-length story that can be enjoyed out of order. Loved this book! Great characters with city guy Adam Clark, single mom Skye Hawkins and her wily son Cody. The three make a great little unit. The story is simple, light, and fun. Perfect for a lazy afternoon read. Adam Clark finds himself on a Colorado Dude Ranch where he is suppose to be meeting up with his friends and partners for some relaxation and a little research for their upcoming video game. When his buddies get delayed he decides to make the best of it and go ahead with the research on his own. Falling for the high spirited, independent owner Skye Hawkins wasn't in the plan but she grabs his attention right away and he won't be deterred. Bonding with her 12 year old son doesn't hurt his chances either! I highly recommend this one! Fun, Flirty, and a little Mystery - Excellent! 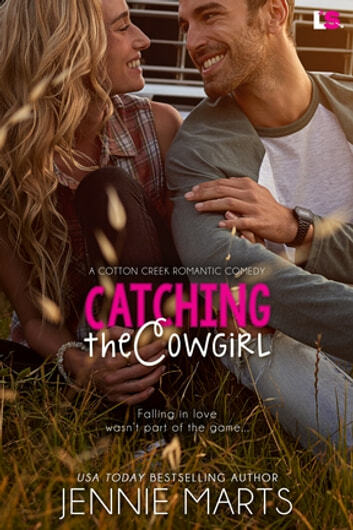 Catching the Cowgirl (Cotton Creek Romance) by Jennie Marts This is video game designer Adam Clark and single mom cowgirl Skye Hawkins’ story. Wow! Wow! I couldn’t put this book down once I started. This book has it all. A sweet, sensual, and fun romance with a little mystery. I fell in love with Adam and Skye’s characters. Skye’s son Cody and the other supporting characters were a great addition to the story too. I loved how Cody and Adam hit it off. They were great together. Adam, computer geek, and Skye, cowgirl, are complete opposites. So as the saying goes “opposites attract” but can they find true love? The story flowed so well and fulfills all the reasons why I love reading romances. So whenever you need an escape, a little comfort, and a feel good romance, sit back with this story and travel to Hawkins Ridge Ranch for Skye and Adam’s fun, sensual, and entertaining story. Excellent read! FYI, contains mature content. I voluntarily reviewed an Advance Reader Copy of this book. Loved this book, a fun romance set at a Dude ranch in Colorado. Skye single mom, the owner of the ranch meets up with Adam, a city boy, game designer. Polar opposites, but they can't fight the attraction. Add in the mixture of Cody, Skye's teenage son, never a dull moment. This is the perfect summer read that will keep you turning the pages. Loved the characters, neither looking for a lasting relationship. Great descriptive writing , you can close your eyes and feel like your at the dude ranch. I highly recommend this book!! Loved this book! It's sweet, fun, and full of charm! Skye is struggling to raise her son and run a dude ranch and is barely keeping her head above water. Adam is a video game designer that co-owns his company with his two best friends. As part of the prep for their next game, the three friends are meeting a dude ranch to spend a week learning about it so they can inject realism into the game. However, the most appealing thing about the ranch is its proprietress, Skye, who makes him feel like a tongue tied teen instead of an accomplished business owner. This is a fun novel that pokes fun at the computer nerd who is a situation very far outside of his comfort zone, yet finding himself smitten with the rancher. She is equally as smitten, but, while opposites can attract, what comes can come next for two people from drastically different worlds? Full of charm, this is a must read for fans of the genre. While is is part of a series, this is a stand alone novel. The author is on my must read authors' list. ...small town tradition and down home living. In a world that thrives on speed, it's easy for a person to get lost in the shuffle. With Catching the Cowgirl, Jennie Marts delivers an important piece of advice with a light heart and a fun time. Adam and Skye have hectic lives that thrive on responsibilities and leave little time for relaxation. All of that changes when they meet each other. Can a workaholic businessman devote his heart to a spirited country girl? Ms. Marts makes it so easy to fall in love with small town tradition and down home living.